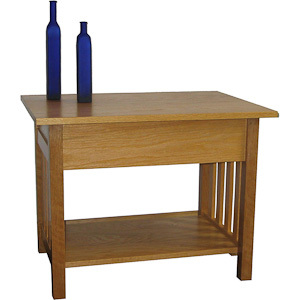 The Cape Neddick End Table is a Mission style table for the living room that offers the clean style reminiscent of the works of Gustav Stickley. This end table matches my coffee table and sofa table. The piece shown here is done in Red Oak with a urethane finish and a tinted Golden Oak stain. The legs and spindles are mortise and tendon with decorative pegs for each leg giving additional strength to the piece. Optionally a drawer can be added to either the side or front. Please specify when ordering.